A group of researchers from Georga Tech have developed a way to use static electricity to charge the battery of mobile devices. Researchers have created a compact generator that produces energy by relative motion of two materials – plastic and metal. Thus, the mechanical energy is converted into electrical energy. However, this design does not use conventional materials, and somewhat modified. 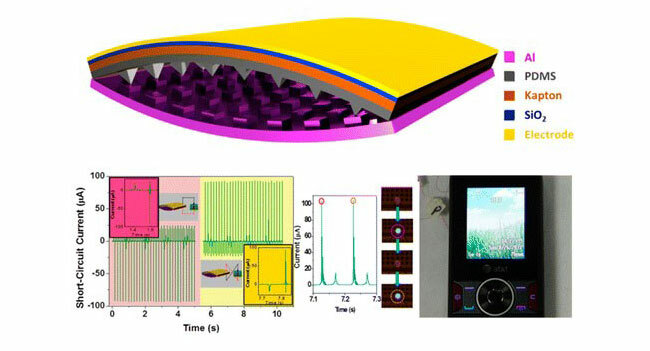 Thus, the surface was structured at the nanoscale, thus improving the efficiency of energy production. As a result, it was possible to transform up to 15% of the mechanical energy into electricity. According to the developers, in order to produce energy so you can join in about 50 pairs of conventional materials. As a result, a small device, which measures 2×2 inches (about 5×5 cm), worn as an armband, can in the users’ movements to generate enough power to charge the battery of your mobile phone by static electricity. It is noted that this technology is still in a development laboratory. Information about the timing of the start of its commercial operation is not reported. Obviously, to the point it is necessary to make a number of improvements. It should be noted that this is not the only such development of Georga Tech. Previously; they offered a way to generate a piezoelectric energy during walking. This was all about how your mobile phone will be charge by your motions or by production of static electricity.